In this post, a basic knowledge on how to import Edible Preparations under Chapter 21 of Harmonized System code is explained. This information is to enlighten importers; a general idea to import Edible Preparations under Chapter 21 of Harmonized System code. Some of the items under this category are prohibited or restricted in some countries. If you are importing any commodity, you need to obtain accurate information from concerned government departments of importing country, as the details given in this post provides only a common idea about import of Edible Preparations under Chapter 21 of HS. Different countries may have their own requirements to import Edible Preparations under Chapter 21 of HS, although most of the procedures and formalities are same in all countries after globalization of trade by General Agreement on Tariff and Trade, GATT. More trade liberalization is expected in near future for WTO countries through Trade Facilitation Agreement TFA likely to be introduced within a couple of years. In most of countries, government registration is required to become an importer in the country who only can act as an importer. Foreign Trade government office of respective country is responsible to issue such authorization to become an importer. For example in India, IEC number (Import Export Code Number) is obtained from the office of Director General of Foreign Trade office to operate as an importer and exporter in India. This process to become an importer is a onetime process, but renewal may be required as per the terms and conditions of such foreign trade office of a country. Nowadays, in most of the countries, the information on such registration for importer – exporter is linked with customs location and reserve bank, as process of imports and exports are online digitalized. So the importers of Edible Preparations under Chapter 21 of HS is also required to contact concerned government agencies of their importing country to verify whether such onetime registration is necessary or not. The importer and supplier mutually agree terms and conditions about import sale prior to actual shipment of imports. Pricing, quality specifications, terms of payment, terms delivery, mode of transport and other terms and conditions are agreed and mentioned in purchase order and import shipment of Edible Preparations under Chapter 21 of HS is effected accordingly. As you know, under any importation of goods, necessary import documentation and customs clearance procedures at importing country have to be completed either importer’s customs broker or importer directly as per foreign trade policy of respective importing country. 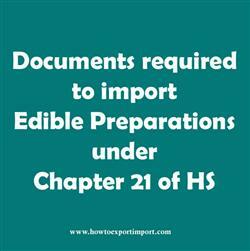 For importing Edible Preparations under Chapter 21 of HS also, import entry documents along with carrier’s document (Bill of Lading /Airway bill), commercial invoice, packing list, certificate of origin and other required documents are filed and necessary import procedures are completed to take delivery of imported goods under Edible Preparations under Chapter 21 of HS. Nowadays, necessary information is filed online and produces required documents at the time of inspection, assessment or delivery of import of goods at destination customs location. The international partners of countries share quality measures each other and exempt from multiple inspection on same products both for export and import. However, as per the policy of most of the developed countries import of goods from Least Developed Countries (LDC) need to be certified by authorized agencies before export. So when importing Edible Preparations under Chapter 21 of HS the details of such information can be obtained from necessary government agencies of importing country. In this article, the documentation, process and formalities to import Edible Preparations under Chapter 21 of HS are explained. As explained above, this information are generally applicable for all countries. These details on how to import Edible Preparations under Chapter 21 of HS are given to provide a basic idea to bring vegetables from foreign country. Specific requirements for each importing country need to be followed by importers and exporters of Edible Preparations under Chapter 21 of HS. I hope, the above information helps you in gaining basic knowledge on documentation, procedures and formalities in importation of Edible Preparations under Chapter 21 of HS. Would you like to comment your thoughts on this article about importation of Edible Preparations under Chapter 21 of HS? Share below your experience in importing Edible Preparations under Chapter 21 of HS from overseas country. Nagalingam S : On 08 July 2015 We already obtained export & import license. But not even single product is exported. We are interested in vegetables, masala powder like that.Our needs are: 1) Could you identify the best importer? 2) could you advise in all stages of export? 3) what is your fees, and other terms& condition? shri man : On 18 April 2016 I have got the IE code just now & very eager to start exporting chilli.I am regularly following & searching net but don't have practical experience. And very confused about the procedure I.e. billing,shipment & whole chain of dealing.Very confused...I badly need a guide to get my pursuance. ansar np : On 10 August 2016 I have plan to start new business in India, But I don't have any idea for making IEC code, customs clearance documents and customs duties. Can I have what's the documents and procedure for registering IEC CODE. what's documents need for customs clearing vehicle spare parts, mobile accessories and toys. origin from china.